Photography and Text By Brandon Batie (subscriber contributor) © All rights reserved. 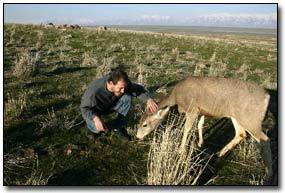 Me with a close mule deer. 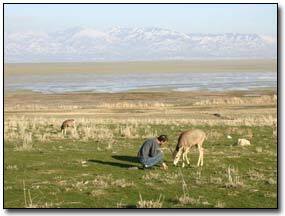 While it looks as though I am calling the deer to come close I am actually plucking the grass. This drew the attention and curiosity of the deer and it came closer, kind of the grass is always tastier on the other side. The deer nudges me as it would another deer in the grazing area. One of the biggest considerations when approaching a big game animal, be it a deer, an elk, a moose, or any of the others, is the animals attitude. Some animals should not be approached by anyone at anytime. Animals, like people, have personalities. Some are aggressive, nervous or plain mean. Others are sweet and innocent. By closely watching the animal you can get a general idea of the animals personality. Most animals will warn you when you are getting too close for their comfort. This can be by grunts, as a moose will usually do. By moving its weight from one foot to the other, often making full or half circles in a small area, the animal is most likely nervous or scared. 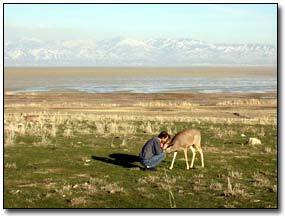 Some, mainly deer, will freeze and tense their muscles. This is fear, moving closer will usually result in the animal running off, or even charging without further warning. A good animal to approach is one who will watch you, then go back to eating or normal behavior. As you inch closer it should not show signs of nervousness or fear. If an animal is lying down it is at a comfortable level with you, this is the best time to approach. Once the animal stands, watch it closely for the above signs. Wild animals that will let you approach are not common. Especially in areas where hunting and high traffic are located the animals will be more protective. In refuges and management areas or areas where hunting is not permitted you have a better chance of finding approachable animals. Once you have singled out an animal to try and approach you have to not act like a human. Humans are, by nature and design, a predator. Most animals will run when a person approaches, even the larger moose, unless cornered. Walking squatted down, or even on your hands and knees, will make you look smaller and less threatening. The clothes you wear will also make a difference in how you look to the animals. If possible dress in earth tones, not camouflage. Camouflage gives a sneaking feeling, much like a predator sneaking up on prey. Animals respond to movement. Both quick movement and very slow movements are a threat to the animal. Many people trying to approach an animal will move very slowly. In the animal kingdom this is considered stalking prey. Your best bet is to try and match you speed with the speed of the animal you are approaching. This can easily be judged by watching the animal. Your next biggest consideration is your eyes. AVOID EYE CONTACT. This is very, very important. Again, direct eye contact is a predatory move. Predators, like mountain lions will stare at their prey, usually, in close proximity, this will cause the animal to freeze. When the prey is frozen, they predator will pounce. This gives the predator a second or so jump on the animal. When approaching never go towards the animal in a straight line. Make a zigzag path in the animal's direction. This side to side motion will appear more like a grazing animal than a predator. Stop often and mimic the animal you are approaching. If it is feeding you can pluck the same grass or bush the animal is eating. Though it may not seem like it to you, the animal can hear you plucking the grass and brush. Repeat this as needed until the animal stops watching you and goes back to normal behavior. This is my personal favorite technique for many animals. If you can make it appear you are grazing then you are not a threat. As mentioned, some animals will be harder, if not impossible, to approach. Your and the animals safety should be the first and foremost consideration. If you are too nervous or scared when approaching you should reconsider. Disclaimer: Approaching any wild animals is a dangerous task, to both you and the animal. Any information contained in this article is solely based on the experience of the photographer, Brandon Batie, and does not ensure any results or safety. Brandon Batie can not be held responsible by anyone reading this article, or using the techniques contain within it, for any harm coming to the reader or any animals.